Upload a pic of your kitten and let him be part of the "kitten battle"
Please select the cutest image of your kitten and upload it! Upload a pic of your kitten and get him into the "kitten battle"
Let your kitty participate in the "kitten battle" contest by adding a picture of him. Please follow the guidelines provided below before uploading your image or posting it on our Facebook and Google+ walls. If your kitten image respects all the guidelines provided below, chances are that it will enter the competition pretty much immediately! The submitted image must be of excellent quality and at least 320 pixels wide and 320 pixels high. The submitted image mustn't be heavier than 3 megabytes and wider or higher than 10.000 pixels. The submitted image must represent only kittens, not full-grown cats or other animals. The submitted image must be your own and represent your own kitty (please don't submit internet images). The submitted image mustn't be photoshopped or altered in any way that makes your kitten look cuter. The kitten must always be the main subject of the submitted photo. The submitted image must be named in a sensible way (eg. my-cute-kitten-miko.jpg, kitty.jpg, sasha.jpg, etc). Please choose and submit only the cutest photo of your kitty. Only one image per kitten is allowed. Please read and agree our image submission policy before uploading your kitten pic. The kitten photo was blurred, out of focus or the overall quality was too low. The size of the kitten photo was less than 320 pixels wide and/or 320 pixels high. 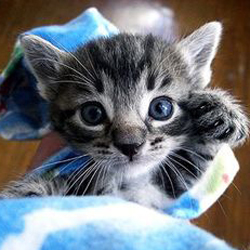 The kitten photo was heavier than 3 megabytes, wider or higher than 10.000 pixels. The kitten was too near or too far from the camera. The kitten was already showcased in our kitten gallery. The kitten photo was not original resulting to be a copyrighted image. The kitten wasn't the main subject of the image with other people or animals being present. The kitten photo had been artificially photoshopped to make him look cuter or funnier. The kitten had been photographed from the back and its face was not visible. Other than uploading an image of your kitten directly on our servers, you can also post it in our Google+ wall or in our Facebook page wall. As for uploaded images, please take a look at our uploading guidelines to improve your chances of seeing your kitty featured in our kitten gallery and battling with the others participants to win the title of the cutest kittens of all times! Notice: by submitting photographic material to this site you agree to the terms and conditions described in our disclaimer page.